The inaugural Art of the Cowgirl event was held earlier this month (February 8-10) at Corona Ranch in Phoenix, Arizona. The event hosted Master Artists that have honed their western crafts in areas such as saddle making, braiding, silversmithing/engraving, photography, boot making, and visual art. The foundation of the event is to not only celebrate women of the western industry, but also to create a fellowship program that would allow a lucky individual to further their trade while working under a Master Artist. It was an action-packed weekend! It began with the ranch horse rodeo prelims on Friday, held at the Buckeye Arena. There were about 20-25 all women ranch rodeo teams that participated in the preliminaries. The top 4 teams were brought back on Saturday for the calcutta and the finals. If you have never seen a ranch rodeo or ranch roping event, it is largely different from a team roping event. 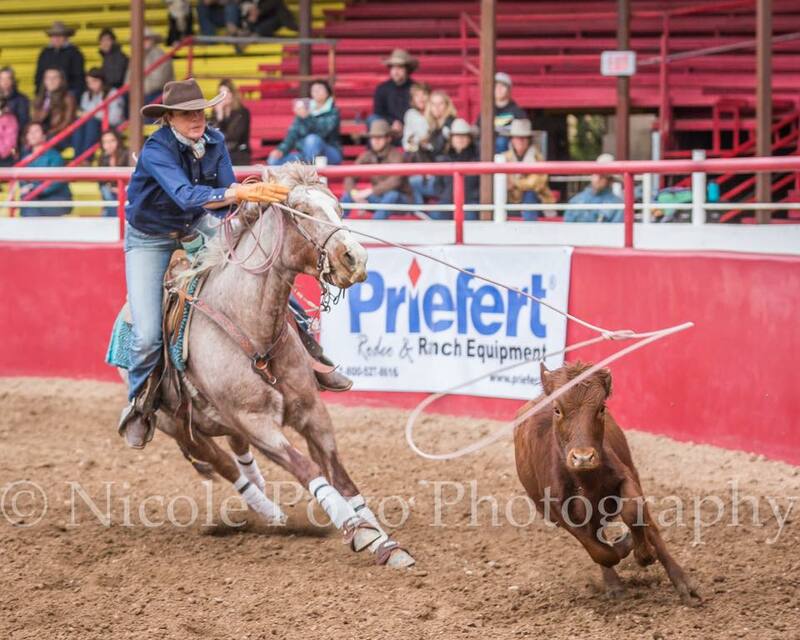 Check out my blog from the Brannaman Pro-Am for more on ranch roping! On Saturday we were treated to a number of events! These included a trick riding demonstration by the one and only Brandi Phillips, a stock dog demonstration featuring Sharon Edsall, and a colt starting demonstration with Lee Smith, Reata Brannaman, Gabe Clark, Kelli and Luke Neubert . If you didn’t get enough ranch roping in during the prelims, Reata Brannaman, Jessica Cardon, Justine Munns and Mesa Pate put on a heck of a demonstration! Saturday night featured the ranch rodeo finals, the art auction, and last but not least, some incredible performances by Trinity Seely, Lynda Thurston & Genuine Cowgirls that kept the dance floor moving all night! Sunday was the elite ranch horse auction which was an incredible selection of horses put together by Mesa Pate. There was a variety of horses to choose from, and Mesa did an incredible job of putting this sale together. The Art of the Cowgirl created a fellowship program, partially funded by the art auction that was held on Saturday night. The goal of the fellowship program is to encourage and further western arts and trades amongst women with a focus being on traditional art and functional gear. This was a driving force behind founder Tammy Pate creating the Art of the Cowgirl. The venue was something out of a storybook. When you walked through the gates you could enter the grandstands where the ranch rodeo finals and the horse sale took place. The courtyard was just off to your right on a plush green lawn. In the courtyard, you found most of the vendors. The vendors were largely women entrepreneurs in the western industry, and sponsors of the event. There was another stage where you had the opportunity to listen to the likes of Trinity Seely, Lynda Thurston & Genuine Cowgirls while shopping or mingling with friends old and new. To make the venue even more scenic, there were rolling hills and mountains in the distance. The art showcase was housed inside a beautiful building, along with a few other vendors. This was truly an event that was marked for the times. It celebrated our western heritage while highlighting the women of the past, present and future and all that we bring to the western industry. If you even thought about going this year, I highly recommend making sure you start planning your trip for next year.